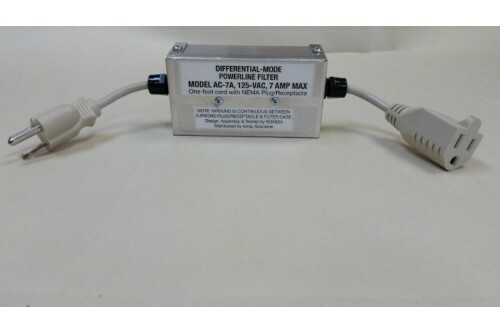 AC-7A - AC line filter with 1 ft cord with 120 V AC NEMA standard plug and receptacle for Wall-Warts or other AC mains devices. The NQN 7-amp AC line filter was developed for high-level RF interference environments, where computer and monitor power-line noise causes a problem with sensitive receivers, as well as with critical listening and recording environments such as high-end audio studios, home theaters, and audiophile stereo systems. 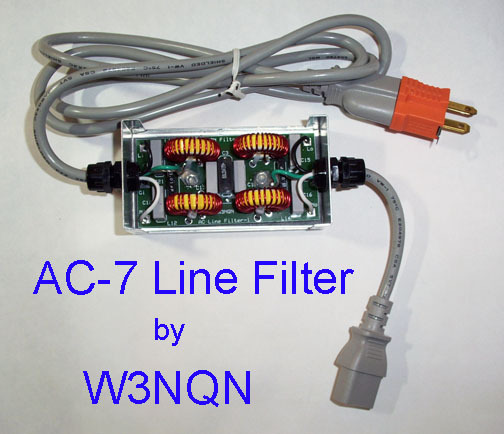 The NQN AC line filter is especially effective in eliminating the high-level AC line noise generated by the six or more computer/monitor systems used by amateur radio operators during multi-multi contesting. Also noise sources such as wall-wart generated RFI is a serious station problem. To address this issue the AC-7 can be supplied with an optional IEC-to-NEMA adapter so wall-warts and other equipment may be plugged into it. See Price list to purchase this option. Line cord radiation is minimized by using a three-wire power line cord having a foil shield and a drain wire. Nine (9) capacitors are used and are all AC-rated Class Y2 or Class X2. Four 52 uH Powdered iron toroidal cores (two per line) provide optimum power-line differential-mode filtering and are rated for a maximum line current of 7 amperes. The foil shields and third-wire ground are maintained via the filter's aluminum case from the IEC female receptacle to the NEMA three-prong male AC plug. The 115-VAC leakage current measured through a 1,500 ohm resistor from the filter case to ground is less than 1.4 milli-ampere. The voltage drop between the filter input and output at a load current of seven amperes is about 1 volt which is less than a 1% drop in the 115-VAC input line voltage. A three-prong female-to-two-prong-male adapter "cheater" is included (with the AC-7 model only) if you need to break the shield ground at your 115 VAC power receptacle to eliminate a ground loop via the shield. The cover is secured to the aluminum case with four 6-32 machine screws into four 6-32 threaded holes in the cover that are provided by the manufacturer. "Computer audio is some thing new. But I think vinyl still has the edge. very well like this. The power conditioner helped, the AC-7 just took it one step further ] I know my system well Jay, any small changes I pick up on quickly. If you would like any more info I would be glad to help. Thanks for a great product." AS-AC15 - AC line RFI filter with heavy duty 6 ft line cord and IEC input connector on back of chasis. For 120 V AC single phase. 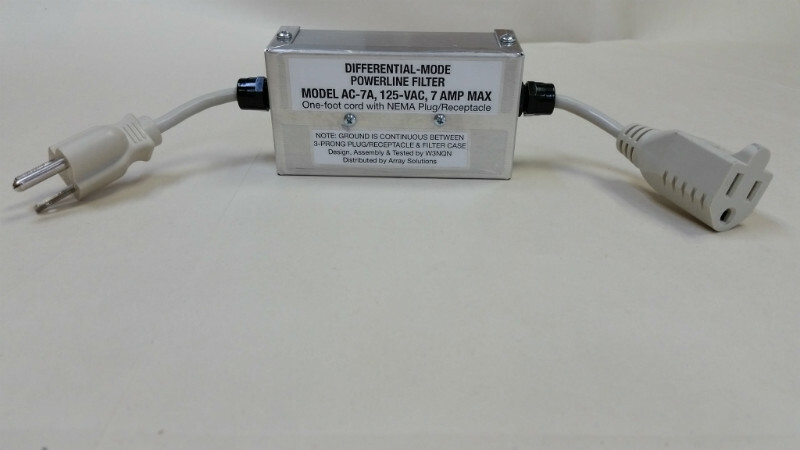 AS-AC15 - AC line RFI filter Features: 15 A - 120 V AC quad outlet for high power devices. &nbs..
AC line filter with 1 ft line cord with IEC receptacle and IEC plug The NQN 7-amp AC line..
AC line filter with 6 ft line cord with IEC receptacle and IEC plug rated at 250 V AC 50/60 Hz ..